Mildred Seaver of Massachusetts registered this fast growing cultivar in 1980. The originator was Allan McConnell who gave the seeds of unknown parentage to Mildred who grew them and named them for Allan. It is a classic plant for the edge of beds and borders because it is small size (13 inches high by 39 inches wide) and multiplies rapidly. Pale purple flowers are borne from mid-July into August. According to The Hosta Handbook by Mark Zilis (2000), "It is often misspelled 'Alan P. McConnell' or 'Allen P. McConnell'". 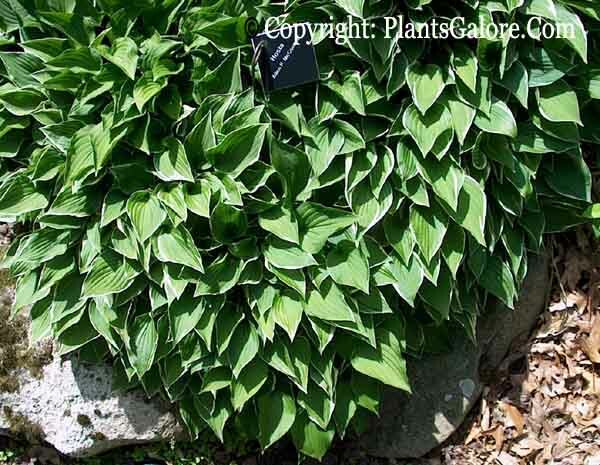 In his Field Guide to Hostas (2014), author Mark Zilis says, "...exhibits a good growth rate...The round, dense mound habit and small leaves with narrow, white margins create an appearance that cannot be mistaken for any other hosta. Two of the named sports out of 'Allan P. McConnell' likely no longer exist. The last time I viewed 'Ivory Pixie' was in 1986, and that garden no longer exists. Every plant I have seen of 'Shades of Mercy' has reverted bact to 'Allan P. McConnell'." "H. ‘Allan P. McConnell’ (1980) – The late Mildred Seaver registered this cultivar in 1980. At the 1984 AHS National Convention in Birmingham, Alabama, W. George Schmid spoke to Mildred Seaver. She confirmed that she obtained the seed from Allan P. McConnell. Accordingly, in The Genus Hosta – Gibōshi Zoku, published in 1991, Schmid correctly cited the originator of H.‘Allan P. McConnell’ as McConnell/Seaver. Recently, Warren I. Pollock contacted Charlie Seaver, Mildred’s son. His recollection is McConnell gave the seed, open pollinated and of unknown pod parent, to his mother, and she named the hosta for him. The custom when this hosta was registered was to list only the registrant, Mildred Seaver. With no designated originator, she often was incorrectly considered to have originated this cultivar. Thus, based on these facts. both Allan McConnell and Mildred Seaver should be credited as Originator. Thus, as with other co-originated hostas the registrar will list the Originator as “A. McConnell & M. Seaver." This may also be written as: H. ‘Allan P. McConnell’ (A. McConnell/M. Seaver - 1980) for publication purposes.